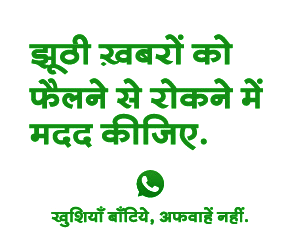 Farrukhabad : Rakesh Sagar Ex.Subedar Former Vice Chairman in SC Deptt. 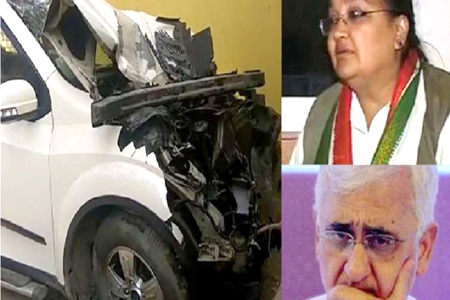 of Uttar Pradesh Congress Committee , said that Unfortunately, yesterday late night at 10.30 p.m. near Gurgawan temple, Farrukhabad while returning from Farrukhabad to Kaimganj, her residence, Mrs Louise Khurshid, ex MLA, wife of Shri Salman Khurshid's car had been hit by a truck. Mrs Louise Khurishid sustained severely injuries and car got badly damaged, however truck driver have been able to escape himself and run away with truck. There has been a serious fracture in her left arm and injuries to her right hand's thumb and also muscle injuries on her left shoulder. Today she reached AIIMS's Trauma Centre New Delhi at p.m. I also got this news and thus reached there, Mr. Salman Khurshid and sons were few other friends and relative Colonel Menon and Congress leaders were also present there. Doctors team ready there, examined her and necessary check ups, X rays were got done immediately. She has been got admitted there, her operation is scheduled tomorrow at 9 p.m. For the God sake, she and her whole family and friend circles were lucky as God saved her life as well as for saving from more injuries and pains/difficulties may cause/arrive. However, possibilities can not be ruled out of this accident that may be a part of conspiracy of getting disturbed/diverted the attention of Mr. Salman Khurshid especially during the election time by his political opponents also.